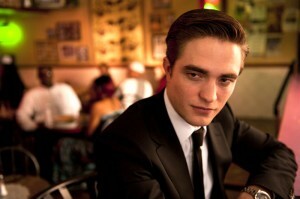 In a recent interview, Robert Pattinson sheepishly admitted that his mother had begun calling him R-Patz. Now that the absurdities have found their way into his family life, will Pattinson’s latest film Cosmopolis finally allow him to rid himself of his Twilight skin? Four years have now passed since Catherine Hardwicke’s vampire series turned the tween world into a group of blood-sucking maniacs and the new “hot couple” in Hollywood, R-Patz and K-Stew, were born. While Kristen has made a conscious effort to detach herself from The Twilight Saga by exploring new roles, Pattinson has all but failed to fully diversify. Cosmopolis, directed by David Cronenberg, is Pattinson’s first major method performance where he holds the stem of the narrative throughout the length of the film. The plot is incredibly simple to follow. Self-made billionaire Eric Packer rides through town in his limousine beckoning different clients to join him and discuss various issues. His tech-savvy limo is a self-made office and, for Packer, it is home. As he continues his all-important journey to the hairdresser (yes, your heard right), clients come in the form of Julliette Binoche, Paul Giamatti and Jay Baruchel. As Pattison begins to lose his grip on his finances, anti-capitalist protests on the streets around him worsen and he is forced to question his role in life. It is incredibly disappointing to witness such a debacle from such a legendary director. Long and ill-thought-out pieces of dialogue do nothing but bore the audience as Cosmopolis tries in vain to engage the viewer. As a protagonist, Packer is very unlikeable and as he continues to ponder (and whine) over life and its meaning, everything gets a bit too self-important. The word “pretentious’” springs to mind. The addition of Packer’s wife Elise (Sarah Gadon) strutting around like a walking cliché only drags the picture down. In true Cronenberg style, the last third of the film raises more questions than it answers and leaves the audience feeling perplexed and a little cheated. In the style of Chris Tookey, Cosmopolis is not just a turkey. It is a 20 Ibs, prize Christmas turkey… with all the trimmings. Avoid.